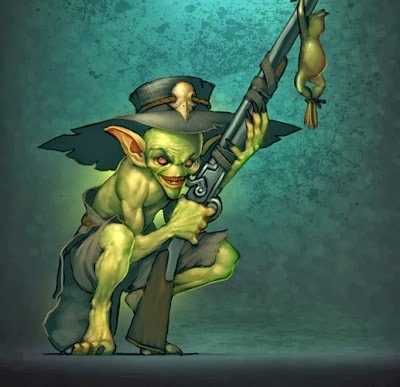 Bayou Gremlins have some good abilities for a 3 SS, significant, minion. They have Bayou Two Card, the ability to cheat fate from the top of the deck. Drunk & Reckless is a version of Reckless that the Bayou's can get however it cost them two wounds for one extra AP. High Pitched Squeel is a decent trigger off of their defense and it is after resolving they get a 4-inch push. With a defense of 5 and a willpower of 4 these guys can go pop, especially considering the mighty 4 wounds these guys sport. They are quick little buggers with a 5-inch walk and a 7-inch charge. Like most Gremlins, they are Ht 1. The Bayous bring the thunder with their attack actions, all with the mighty stat of 4! Their Boomsticks can reach out and touch you at 12-inches with a 1/2/3 blast damage profile. This Attack has to declare a trigger and it has a trigger for every suit. • On Rams, you get Dumb Luck a 2/4/6 blast damage profile but the Bayou suffers half of the damage the target suffers. • On Crows you get a Whoops, Ricochet, after you resolve (whether you hit or not) the closest other friendly model within 12-inches and line of sight will suffer 1 damage. • On Tomes the Bayou wonders, “What if…more powder?” this trigger ups the Bayous damage profile to 1/2/ blast 3/double blast. • On Masks, the Bayou declares “I got ‘em, Pa!”, after the attack succeeds the Bayou is pushed 3-inches directly towards the target. The Bayou also has a Ml attack of Banjo Bash, a Ml 4, 1-inch, 1/2/3 damage attack. If you are caught between two Bayou’s I guess you could bear witness to dueling banjos! These guys are cheap and meant to die, hopefully taking some enemy models with them. They like to swarm, in a 50 SS game you could field up to 15 of these little buggers. These little guys depend on outactivation and numbers to bring down enemy models. In a Somer led crew, you can control which trigger you want them to have, as well as replenish them throughout the game.